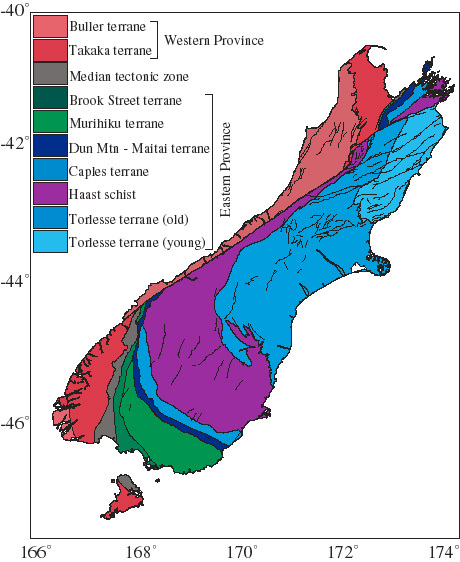 A terrane, as distinct from the more general topographic term 'terrain', is a crustal block or fragment that is typically bounded by faults and that has a geologic genesis distinct from those of surrounding areas. In paleogeography, a terrane is the accreted block that has sutured to a craton (continental nucleus) and that contains distinct rock strata of distinct genesis. 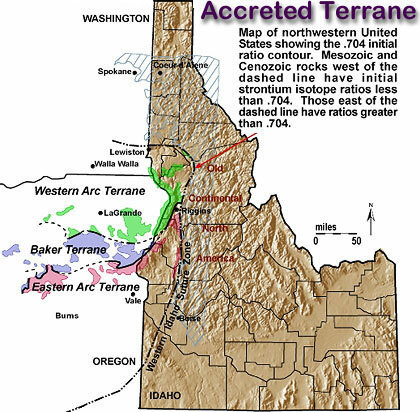 Thus, accreted terranes have become attached to continents as a result of tectonic processes. Superterranes are defined as composite terranes that comprise groups of individual terranes and other assemblages that share a distinctive tectonic history. The Canadian Cordillera is an example of a complex, accreted terrane that is composed of five sub-parallel morphotectonic belts that result from Mesozoic and Cenozoic collision and deformation and accretion of allochthonous superterranes to the North American Craton. The Intermontane superterrane was accreted approximately 180 Ma, and the Insular superterrane was accreted approximately 100 Ma. The Coast Belt contains the suture resulting from the mid-Cretaceous collision between the exotic Insular superterrane and the previously accreted Intermontane superterrane. The accretionary suture was subsequently overprinted by the evolving subduction-related magmatic arc that persists as part of the modern Cascadia subduction zone. The Omineca belt represents the suture to the east of the Intermontane superterrane. The texture of a rock is determined by the size and configuration of its constituent minerals and any presence of gas bubbles. Rock fabric refers to the general appearance of a set of crystals that have grown together to produce a distinctive shape or texture. The term "fabric" is best applied to groups of crystals, or to invidividual crystals within groups, which have grown together so that their growing surfaces have encountered each other. Crystal habit is the general appearance of a crystal that results from the nature and prominence of crystal forms, such as faces or sets of faces. The term "habit" is best applied to invidividual crystals that have grown without their growing surfaces encountering any pre-exisiting solid (encounter = fabric). The microstructure of a rock is its set of structural features, such as grain boundaries, grain size and structure, which can be observed in thin-section (under a microscope). ...granuloblastic – typical of granulites, which have even-sized, granular mineral grains with weak preferred orientation. Microscopic structure reveals small, rounded grains forming a closely-fitted mosaic. non-foliated – in which constituent minerals lack an ordered arrangement, retaining roughly the orientation of grains present in the country rock before thermal metamorphism; Eg. quartzite, marble, metaconglomerates, hornfels, anthracite coal. Euhedral crystals are distinct, well-formed crystals with sharp, easily-recognized faces (almandine garnet in quartzitic gneiss at left). Euhdral is opposite to the interlocked grains of anhedral textured rocks that have cooled in the crowded environment of magma chambers. Subhedral crystals are intermediate in character between distinct euhedral crystals and enmeshed anhedral textures.